While waiting for the final Sea tests for the new Shtil-1, frigate-launched surface to air missiles, India has expressed interest in purchasing this upgraded SAM for its Navy. It is possible that China, which also owns earlier models of the Shtil, will be interested in buying the SAM for its frigates. India has shown interest in buying the new Shtil-1 naval surface to air missile (SAM) systems, being installed on frigates 11356 project, Maxim Kuzyuk, Tekhnodinamika General Director, told RIA Novosti. "Now everyone is waiting for the state testing of the first ship of the ‘Admiral series’ (project 11356) to be complete. That is when the new SAM will be accepted into service with the Russian Navy, after which it will be possible to deliver it overseas. Today India has shown interest in acquiring the new Shtil. We are discussing deliveries as part of the upgrade of old vessels and the construction of new ones,” Kuzyuk said. 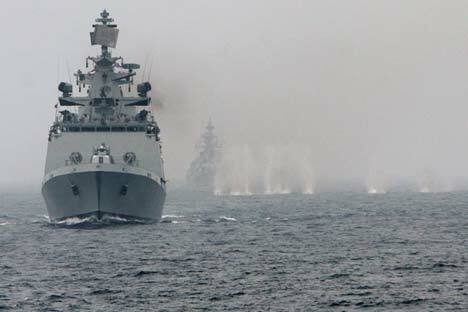 India has already received six ships of a similar class to 11356, but they were equipped with an old model of the Shtil, which can launch once every 12 seconds, while the new Shtil-1 can launch once every 1.5-2 seconds. The Shtil-1 may also interest China, whose forces are armed with the old version of the SAM. "China has six project 956 destroyers which are armed with the Shtil. Russia also has such vessels. Repairing the old SAMs is meaningless. Therefore, in the future, the current upgrade may interest not only the Russian Navy, but also our Chinese partners,” said Kuzyuk. Launch and ground equipment for the medium range Shtil-1 SAM is produced at the scientific-manufacturing enterprise “Start” (which is part of the Tekhnodinamika holding). The system is designed to engage all the modern means of air attack at medium range and at altitudes from five meters to 15 kilometers. A distinctive feature of the system is the use of the updated surface-to-air missile with a vertical start, and the use of multi-function radar with phased array antennas. The Project 11356 frigates (being built at the Yantar ship docks in Kaliningrad on the Baltic Sea) are designed to carry out military operations in the ocean against enemy submarines, and to resist aerial attack, both independently and as part of a convoy of ships. At present there are six Project 11356 frigates being built for the Black Sea Fleet, which are to be launched by 2016.